Andhara cabbage Curry is a very popular recipe. 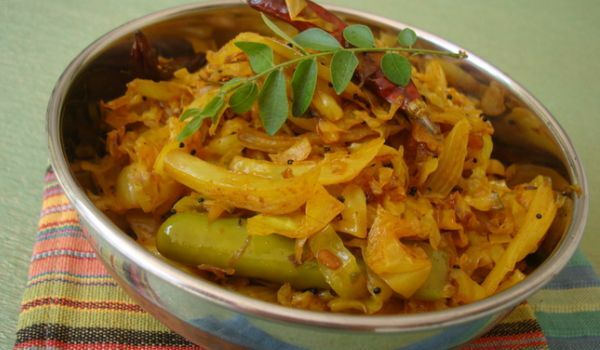 Learn how to make/prepare Andhra cabbage Curry by following this easy recipe. Finely chop the cabbage and cook it with water, salt and turmeric. [Drain the water from it and keep aside]. Grind the mustard seeds with red chillies into a fine powder. [its preferred, not to roast them]. Heat the oil in a pan and put the ingredients for Tadka and finely chopped green chillies. Add the cooked cabbage and season it with salt and chili powder. Finally add the ground mustard powder and curry leaves and cook for 2-3 mins on low flame. Serve it hot with both chapatti/roti and rice.